Filled with fantasy, comedy and grand suspense, Around the World in 80 Days is classic entertainment that is sure to enchant listeners of all ages. When an eccentric Englishman named Phileas Fogg makes a daring wager that he can circle the globe in just eighty days, it’s the beginning of a breathlessly-paced world tour. With his devoted servant Passepartout at his side, Fogg sets off on an adventurous journey filled with amazing encounters and wild mishaps. Pursued all the way by the bumbling Detective Fix, who believes the two travelers are bank robbers on the run, Fogg and Passepartout must use every means of transportation known to 19th-century man—including a hot-air balloon, a locomotive, and an elephant—to win the bet. When Jules Verne’s delightful tale of two globetrotting gentlemen first appeared in 1873, it won the hearts—and imaginations—of readers across Europe. 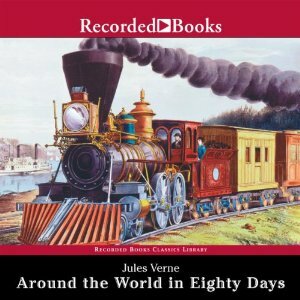 Published chapter by chapter over the course of many months, Around the World in 80 Days aroused so much excitement that readers placed bets on the outcome of Phileas Fogg’s race against time.